I learned a few things in 2014. This is one of them. René Redzepi is the best chef in the world. This is all I knew about Redzepi as we drove down to County Cork for the Ballymaloe Literary Festival last May. His restaurant Noma is the best restaurant in the world. That and something about Scandinavia and impossible reservations. The Redzepi session was sold out when we got our tickets, and I wasn’t too concerned about it. But in the car on our way, I saw a tweet about an extra ticket to Redzepi and I snatched it up. So I had very little expectation of this greatest chef in the world. As a matter of fact, I was surprised when the thin, shaggy haired guy that I almost bumped into coming back from the loo appeared moments later on stage. Not as surprised as our friend Caryna was when she asked for his ticket at the door, however. Redzepi began to tell us his story. I was fascinated. He told us about growing up with a Macedonian father and Danish mother. On holidays when his schoolmates were taking off to Italy or France, he would visit family in Macedonia. He was ashamed of this as a child. There were few amenities in Macedonia. They slept on the floor and ate communally. There was no word for ‘foraging’. Foraging was part of what they did for food. Meat was for special occasions. Oh, the excitement of those days. The kids would help chase down a chicken, and bring it to an aunt. It would be slaughtered right there, no doubt, and they would watch her pluck the feathers with anticipation. Then it would go into the oven, and still they watched, the skin turning golden, the smell just driving them crazy, and fat dripping onto potatoes below. And then finally the eating. Everyone together, eating from shared plates. Licking fingers. The ‘old ways’ are foodie Shangri La now. We suburban souls who grew up knowing chicken only in square packages from antiseptic, white supermarkets, or in a bucket shoved through a window in a drive by dining. Oh, we crave authenticity! So Redzepi is right on point with current farm to mouth trends. (Confession: I personally have never even bought a whole chicken. I’d be a horrible pioneer, so I’m a bit like, Redzepi did it, so I don’t have to….) But the thing I like best about his recounting of his childhood is that best-chef Redzepi recognizes something he considered a deficit turned out to be a strength. It wasn’t something he asked for. It was given to him. Redzepi’s tale continues with a bit of disaffected youthdom, signing up for cooking school with a mate, and then not immediately, but at some point realizing he was kind of good at this, and he liked it. So, onward. He emphasized in his story the value of mentoring, of having someone who wants the best for you. And he gives much credit to the luck of timing, the way his path took him from Ferran Adrià to Thomas Keller to Grant Achatz. Yes, he was eager to learn, he was bold to ask for jobs, but he seems a bit amazed still at how many doors actually opened when he knocked, and that he absolutely wouldn’t be where he is if they hadn’t. Redzepi values the path. Working as a waiter was a crucial stage he says, to be the person presenting that plate of food, to see the reaction, both good and bad. He never wants to lose that connection. Doesn’t want to be the chef holed up in the kitchen. Would you invite friends over for dinner and never leave the stove? He had to learn to manage the people in a kitchen–the things they don’t teach you in culinary school. It would have been worthless to achieve something like World’s Best Restaurant, he says, without being able to share it with a team. Another key moment from his story are they early days of Noma when a lunch service had zero customers. Zero. Take note: everyone has to start at zero. 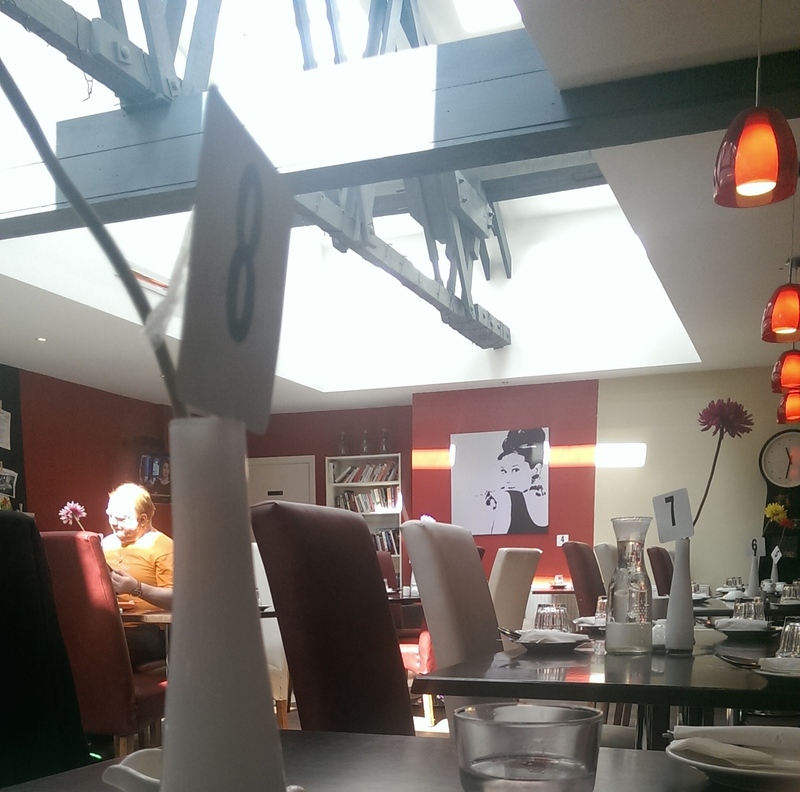 I wrote in my notebook: René Redzepi likes lunch! I like lunch too! Although I think this statement was about keeping perspective, not discounting certain eating experiences. I think Redzepi would love to have a food truck. You gentle readers probably already know everything I’ve written and more about René Redzepi, have already read his Journal, of which I am only on page 40 (19th March), possibly have even cooked something from the supremely beautiful (that light! ), borderline insane Noma cookbook (hay oil!). I’m so glad I was able to discover Redzepi in person and hear his story. I came away so full from his talk. Since he is a real person to me, I might take the time to understand why one would take a carrot, sous vide it for 45 minutes, then char grill it for an hour (turning every 15 minutes), brush with a sea buckthorn reduction and then dehydrate for 4-5 hours. (Recipe, page 58). That is putting a lot of faith in an orange root. But it is winter. We have carrots and little else, so we are going to cook the heck out of that carrot. You go, René. Call me. We’ll do lunch. I learned a new word this year. And while I have both tsundokud and kummerspecked (and am always fixin’ to), one word shot into my heart with an arrow of recognized truth, and I think it did for you too. And you whispered “Yeah..” And I imagine you smiled. Yeah…Sobremesa. Not being Spanish, maybe I don’t know Sobremesa in its fullest, but I do know what it is to linger over the table, in that glow of contentment both physical and emotional. Fullness. One particular day of Sobremesa stands out from the past year. It was in Round Rock, Texas, at the concrete-pillared intersection of Interstate 35 and 3406, in the sunny, front room at Chuy’s. ** With six friends who had not all shared a table in many years, since one of the boys among us was a baby, and the other not even a glint. The boys are lively, little people now, drinking chocolate milk, but also the bewildering evidence of time passing, even if it felt like no time had passed at all. In Tex-Mex tradition, I think we front-load the Sobremesa. Gearing up for our meal over many baskets of fresh, hot tortilla chips and salsas and the irresistible mystery that is jalapeno ranch. Baskets emptied and then filled. Time passes, but is then restored. Giant glasses of iced tea and diet coke sucked dry, and then in a blink, full again. A never ending spring. We say, No More, but then continue to crunch away, in shared denial that we each have two pounds of food on its way. Steak burritos and Chicka Chicka Boom Boom. When the food arrives, it is platters laden with comfort, doused in spicy sauce. With your choice of rice and beans. And afterwards, no dessert. There is never any dessert after Tex Mex. 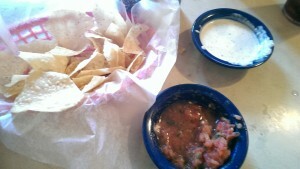 One would have to eat less chips and salsa, and that never happens. But after the plates are cleared away, no one moves to gather belongings and leave. Our glasses keep being filled. We stay. We linger. On this day I remember discussing the paintings on the wall, of watermelons growing on trees and frogs dancing with princesses. Fantastical. It is all so very fantastical! This curly headed lovely with a giant heart and giant smile, and her man (for he is truly manly) who lives to help others. And the tall, broad-grinned guy with a specialty laugh, who has learned to eat spicy salsa, and who knows every kid’s name, everywhere. And his blond beauty, who is thoughtful and creative and a bit serious in a way that gives her such substance. And my guy, who combines killer wit and kindness and is so excellently bearded. And me, who will make you laugh and laugh with you and will cry with you too. In that moment, we are our best selves. We are all truly wonderful. The Sobremesa was fueled by the soothing familiarity of the surroundings and these faces, and the pleasure of being at rest. A lot of life orbits had to align for us to have those hours together. As in all friendships there have been sorrows and joys, some shared directly, some observed. And in our larger circles there are even more joys and even more sorrows. 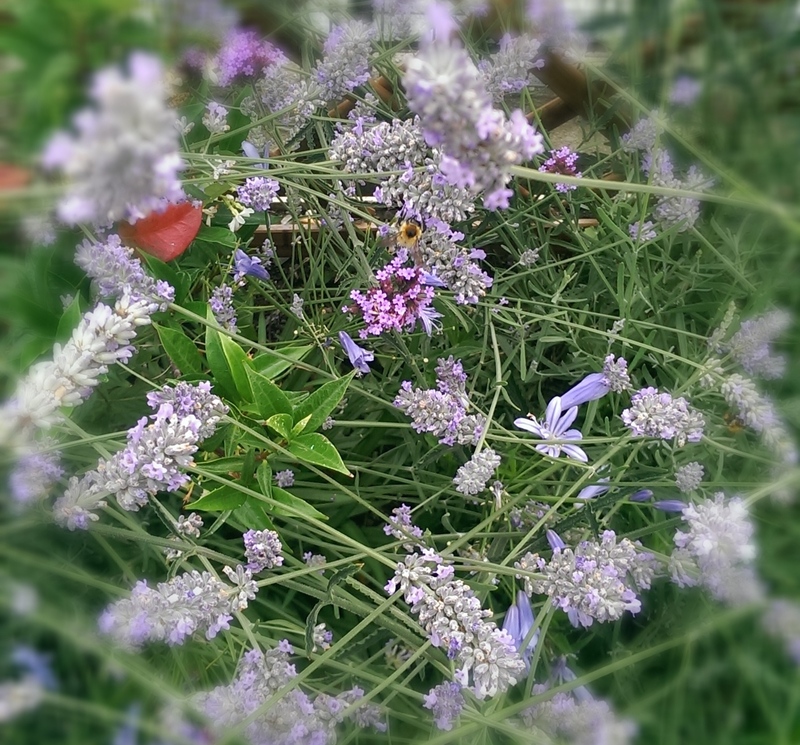 Later that day we would visit a friend in hospital, and perhaps that’s one reason why we lingered. Everything in that moment was lively and bright. But not too bright, the Texas heat kept at bay by air conditioning, and any particular sadness or worries driven away by laughter and genuine smiles and hearts being replenished. We stay. The power of the table is strong. Our time spent there is not frivolous. Let us invite one another. Let us linger. * I kid. ‘Fixin’ to’ is English! Although some would disagree. ** Related reading: My defense of Chuy’s. Hear that? That’s the sound of me prying open the blog to tell y’all something cool. And mildly shocking. Weellll, technically I chopped and stirred. And crunched. The crunching was the best bit. This chopping and crunching happened on a day organized by Clare of An American in Ireland to volunteer in a CrossCare Community Cafe. In addition to being a blogstress, Clare works for Kellogg’s. 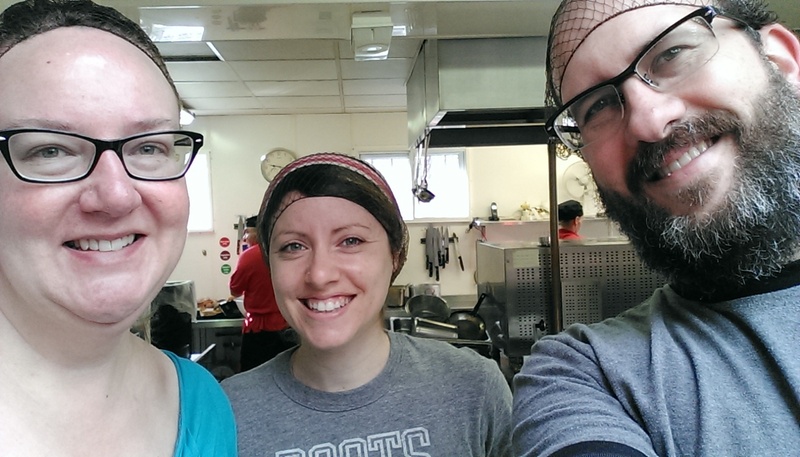 As part of Kellogg’s support for CrossCare, Clare invited folks with amazing kitchen skillz to prepare the noon meal for CrossCare customers, using donated ingredients. This list of dignitaries included Clare herself, Lily from A Mexican Cook in Ireland, Rosanne from Like Mam Used to Bake, Caryna from Caryna’s Cakes, and our very own Gunternation Bill. And me. Yeah, this is one of those times, kids, when you have to blend. And I mean blend as in, look like you belong without calling any particular attention to yourself, not blend as in blend ingredients, as that might be too MasterChef! Caryna, Bill and I were assigned to the Portland Row Cafe while the other crew worked at Crosscare’s Holles Row location. The day was sunny and bright and I was immediately impressed with the open, colorful cafe. While the Portland Row location has functioned as a soup kitchen for many years, the facility was remodeled in recent years, with original roof beams now being lit by sun streaming in through skylights. A few people were having breakfast in the inviting dining room, and the kitchen with busy finishing off preparation for that day’s Meals on Wheels. 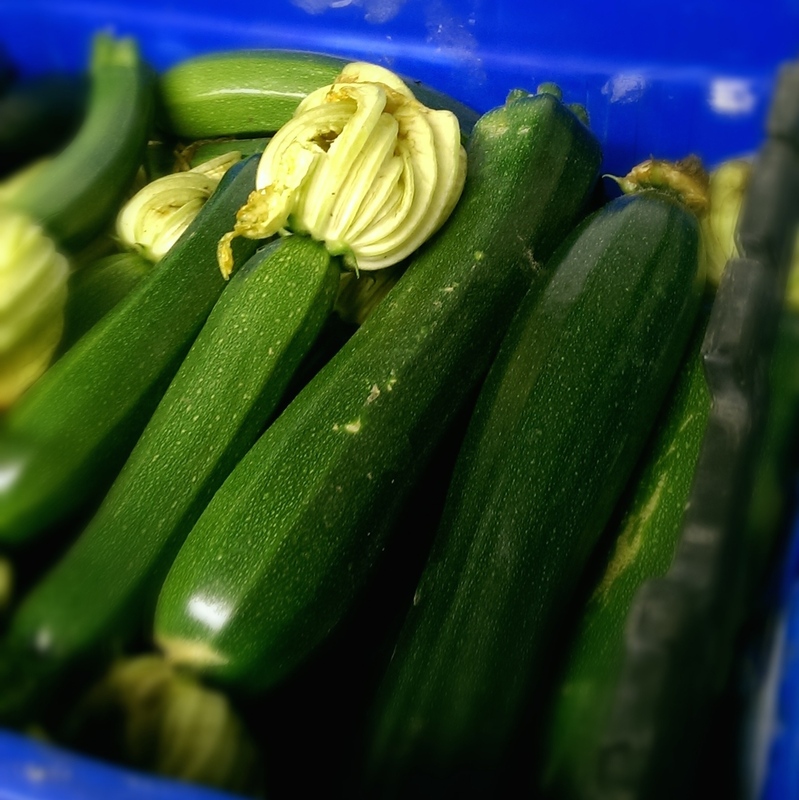 We were given a tour of the kitchen, larder and store rooms, and immediately noticed a supply of beautiful courgettes with blossoms still on. “It has to be vegetable lasagna,” we agreed, and Caryna went to work on the sauce. She is Italian after all! Beautiful veg straight from the farm. Bill and I started chopping the veg for roasting: courgettes, onions, some peppers and a bit of sweet potato. Bill put two pans of veg in for roasting while the sauce was simmering. On our tour of the storeroom we had spotted the array of cereals that Kellogg’s supplies through their Breakfast for Better Days program. We discussed using some Crunchy Nut flakes in a dessert, but weren’t sure we’d have time to make two dishes. 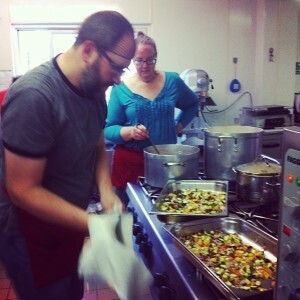 But just as the roasted veg was ready, we saw tweets and instagram boasts coming from the Holles Row team. They were making lasagna and rhubarb crumble! “We can’t let them beat us!” Caryna cried and we both ran to the larder. We had a few canned fruits to choose from. 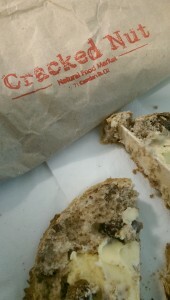 (CrossCare had just lost most of their refrigerated and frozen goods in a recent power outage.) I had a childhood flashback to a quick and easy cobbler made with fruit cocktail. So that’s what we did. 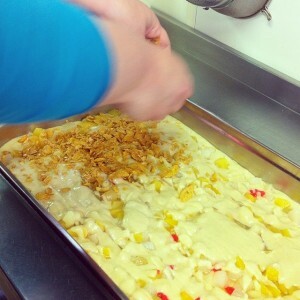 And of course we topped it with Crunchy Nut flakes. Bill constructed the lasagna while Caryna and I put together the cobbler/cake/bake. Using cereal flakes to top a sweet or savory dish is quite common in my culinary heritage, so I knew just what to do! Both of our dishes went into the oven and both came out golden brown and delicious. Our roasted veg lasagna, ready for service. The cafe was full for lunch service. 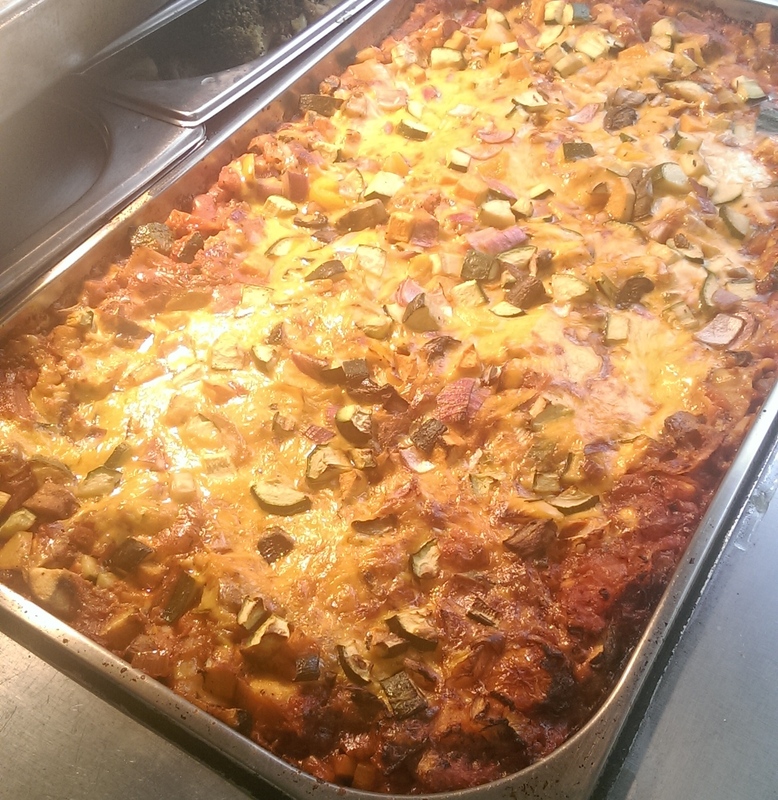 CrossCare Cafes are open to the public, with the goal to provide nutritious meal to everyone in the community, even those with reduced means. There were folks of all ages dining together the day we were there. The kitchen manager shared many stories of connections being formed in the community, of former Meals on Wheels recipients who now come into the cafe at lunch, and of people who venture into the cafe when they might not otherwise know where to go for help. For those of us who love food, it’s extremely gratifying to see the community life that comes from giving people a place at the table. The cafe has lovely flowers out front. 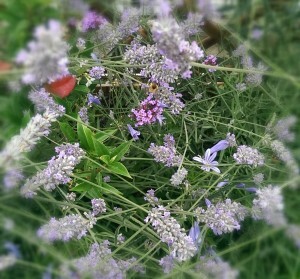 They even provide food for the bees! The kitchen staff were great as well. Most of them are volunteers, and they kept the kitchen humming. We didn’t scrub a single pot. Everyone did their job with a smile, and occasionally a song. And although I joke about not being able to cook (it’s just that Bill cooks so much better), I had a great time in the kitchen working alongside Bill and Caryna. Anyone can cook. Just get in there and start chopping! There are many reasons to eat hummus. At least ten, in fact. Natalie Portman eats her own weight in hummus every day. But the most important reason to eat hummus is that it’s just damn delicious. Scoop it up with pita, spread it on a baguette, dip your carrot sticks in it, eat it with a spoon–it’s all good. And once you’ve made it at home you’ll never buy it from a shop again. Whiz the ingredients in a food processor. The amounts here are very malleable. Love your sesame paste? Add more tahini1. Prefer it thinner? Add more liquid. Feeding more than two people? Double or treble everything. It’s completely customizable. And if you want to take it to the next level, use leftover chickpeas you’ve cooked yourself2 (about 250g of cooked chickpeas for this recipe). 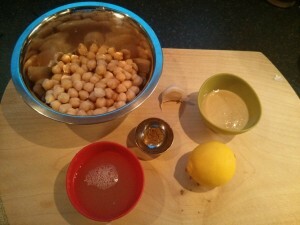 If you’ve never made hummus at home or even tasted it, please give this recipe a shot. A word of warning, though–you may find you’ve something in common with Ms. Portman. 1Don’t let anyone tell you the tahini is optional–it’s not. 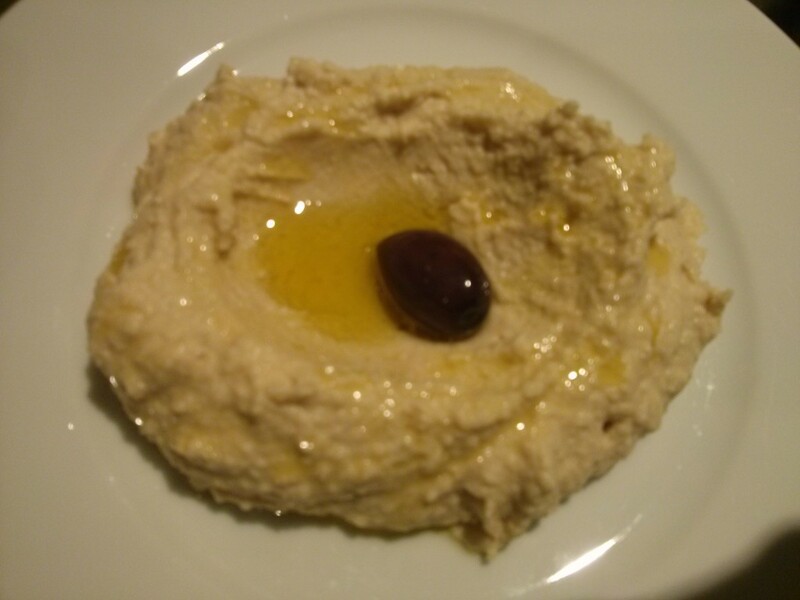 If you don’t like tahini or are allergic, leave it out but don’t call it hummus. Throw in some chopped fresh rosemary and call it an Italian chickpea spread. 2Honestly, if you’ve never cooked chickpeas from dried you’re in for a real treat. They’re a revelation. Put chickpeas, garlic, juice of half a lemon, cumin, tahini and 1/4 cup reserved chickpea liquid in a food processor. Process until smooth, about 30 seconds. Season with salt. If you like a thinner hummus add a bit more cooking liquid. You can adjust the lemon and tahini as well. Serve drizzled with olive oil and topped with an olive, if desired.